Google “lean manufacturing” and you will find a virtually endless font of information regarding formal lean implementation. You’ll see definitions for Japanese words such as kaizen, gemba, muda, mura, kanban, and so on. You will also find other variations or iterations of lean, e.g. : Six Sigma, Lean Sigma, TPS (Toyota Production System), TOC (Theory of Constraints), JIT (Just in Time), and others. While universally known as a Japanese “invention” that was popularized by Toyota, lean in fact traces its roots to the work of post-World War II American occupation forces in Japan. Just like most of the gear industry, we're extremely busy here at Gear Technology. While many of you are working hard to produce more gears, we're doing the same with magazines. 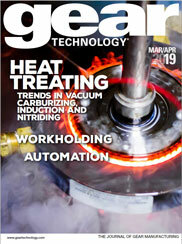 We were delighted to see the plastic gear set pictured on the cover of your March/April issue. UFE played the lead role in its design and manufacture. Over many years of being in the machine tool business, it has been interesting to observe the way we suppliers are forced to quote and sell machine tools to many large companies. On May 20, the city of Pittsburgh celebrated the 130th anniversary of the Duquesne Incline, a funicular railway that allows passengers to travel via cable car to an observation area and catch a panoromic view of the city and—most importantly—get a bird’s eye glimpse of the gear teeth in action.